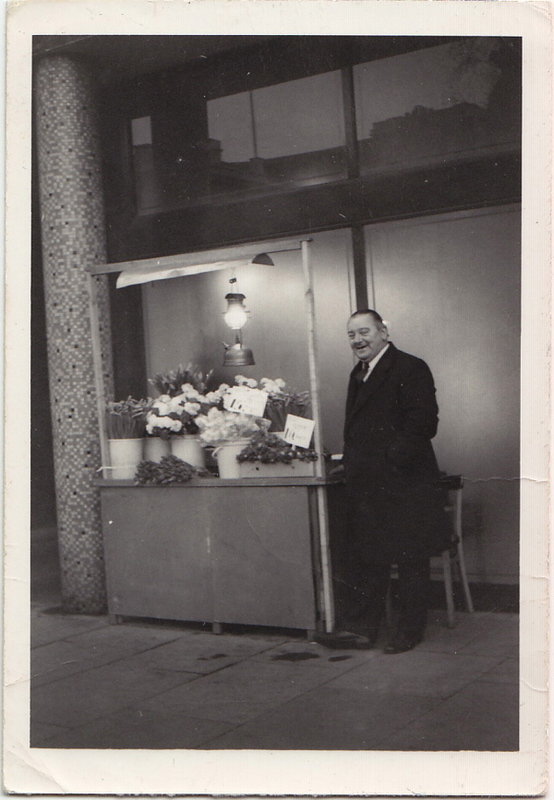 Although the man in the foreground is unaware, this photograph records an historic moment in the City of London – Tony Purser’s last day selling flowers from his stall in the vicinity of Fenchurch St Station after fifty-two years of business. I took the opportunity to walk over from Spitalfields and sit with Tony to keep him company for a few hours on his last afternoon. A dignified popular figure with a ready smile, Tony told me he remembers the very first day of business. 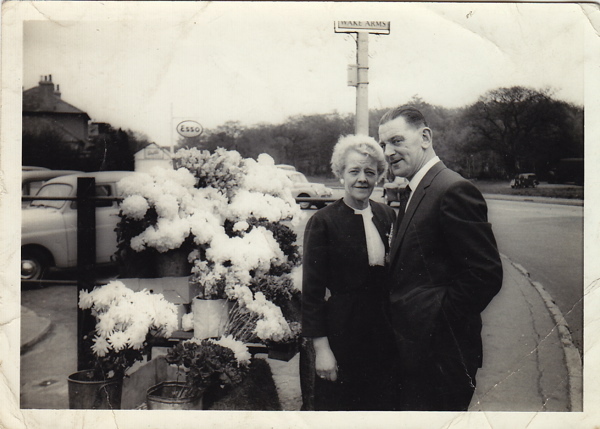 He was driving around in a van with his father Alfie in 1959, looking for a place to sell flowers and they drew up outside Fenchurch St Station, parked the van and decided to start trading at once. “It was quite a success, but I wasn’t that interested,” said Tony, bemused at his former self, “I was just a kid, I was cold and wanted to go home.” Tony never dreamed that he would still be there over a half a century later, yet his father’s instinct was a good one because the passing trade ensured that for fifty years Tony earned a living selling fruit and flowers in the heart of the City. Without a licence in the early years, Tony & Alfie were regularly arrested, their stock was confiscated, they were fined three shillings and spent the night in the cells at the Bishopsgate Police Station. An event that recurred until they were granted a licence in 1963. “My father started in the nineteen forties and my grandfather was in the business before him, so he thought you didn’t need a licence, but if you’re licenced you don’t get any trouble from the police.” explained Tony ruefully. “He was a fruiterer just after the war, one of seven brothers and sisters, who all worked for him at one time or another. He was still working when he was eighty-four – a good old boy he was – but I want to enjoy a bit of life before I die.” Tony admitted with a smile of eager anticipation at the thought of no longer getting up every morning at half past three, working until seven at night and spending all day on the street exposed to the weather. 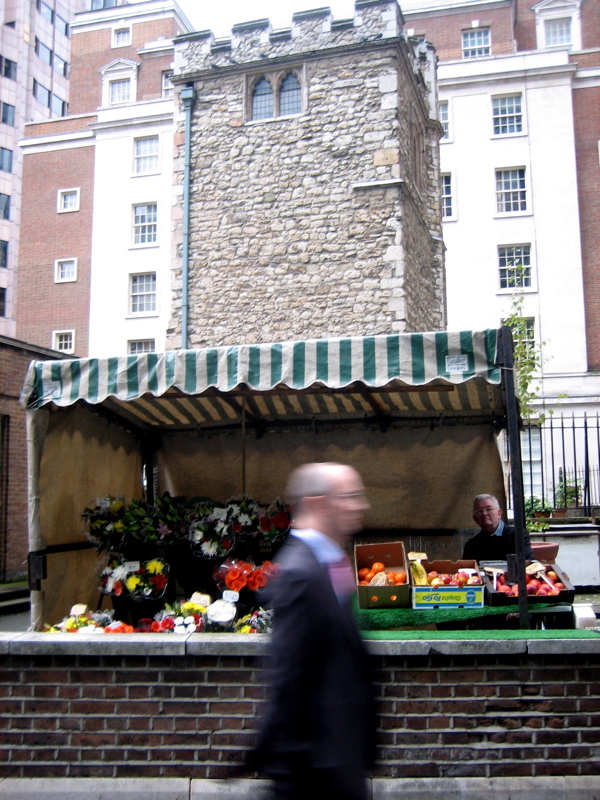 In 1998, when Fenchurch St Station was rebuilt and rents increased, Tony moved over to a new location nearby at the foot of the neat little medieval tower of All Hallows Staining in Mark Lane. He enjoyed another ten years of profitable trading there, but in these last two years Tony has made no money at all, though he has continued undaunted, going to the flower market at dawn, setting up stall each day and selling flowers to a dwindling number of loyal customers while living off his savings. “One guy, he gave me five pounds for a banana!” continued Tony with crazed amusement, now that he had detached himself emotionally, uplifted by these gestures of appreciation. In confirmation of Tony’s situation, there were more people asking for directions than customers on that last afternoon and our conversation was constantly interrupted by enquiries for directions to the intriguingly named Seething Lane. “I get plenty of enquiries, if I had a pound for every one I should be a rich man,” commented Tony, rolling his eyes ironically. Yet Tony always gave directions as if it were the first time he had been asked, which struck me as remarkable largesse after fifty-two years. Tony’s heroic composure was both in line with the strength of character that has got him through the last half century trading on the street and indicative of his sense of relief at letting go of the responsibility too.”I’m not angry because the trade has been good to us, we’ve done very well. We used to take the whole of August off, though I’ve not had a holiday in twelve years. I’m sad because it’s been my life, but the trade is over.” he confessed to me in a quiet moment. Once the flower buckets were empty, Tony began giving away bags of fruit to surprised customers who only asked for an apple or banana. He gave me a bag of oranges to take back to Spitalfields. Then Mark, a droll Liverpudlian, stopped by to pick up the weekly bunch of flowers for his wife. He shook hands with Tony, brandishing the lilies for his wife extravagantly, “That’s the last she’ll see for a while,” he quipped. It was the end of an era at Fenchurch St Station. 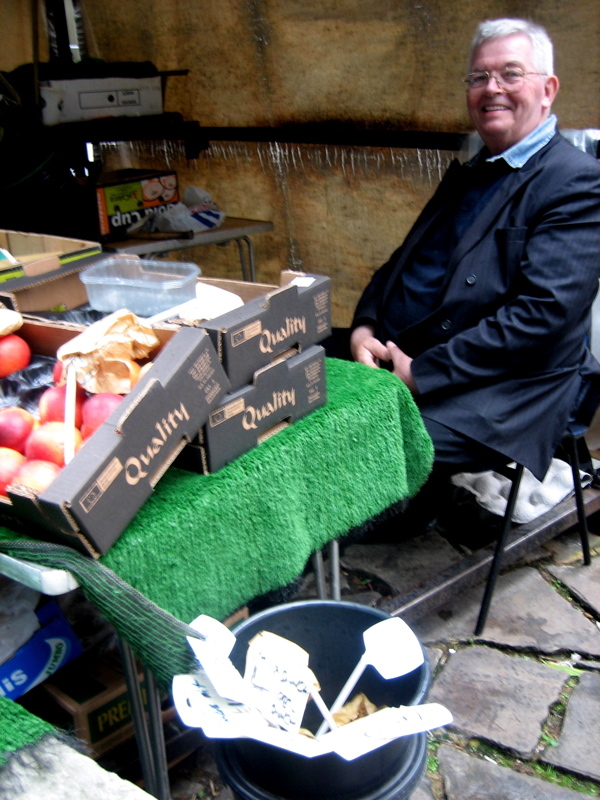 Tony Purser, his last day on the stall. Alfie Purser, selling flowers at Tower Hill Station, nineteen seventies. Alfie selling flowers at the Wake Arms, Loughton, nineteen sixties. 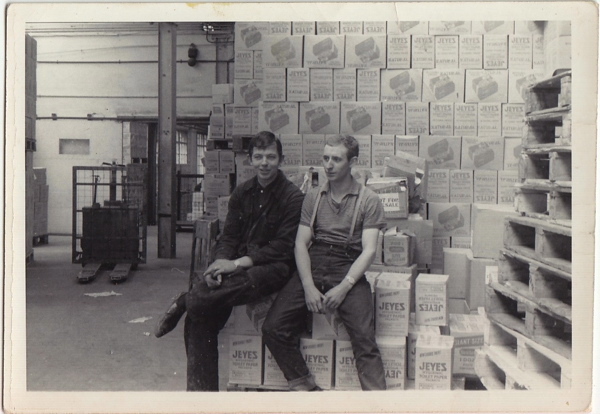 As a young man, Tony (left) briefly tried working at the Jeyes Fluid factory in Plaistow. 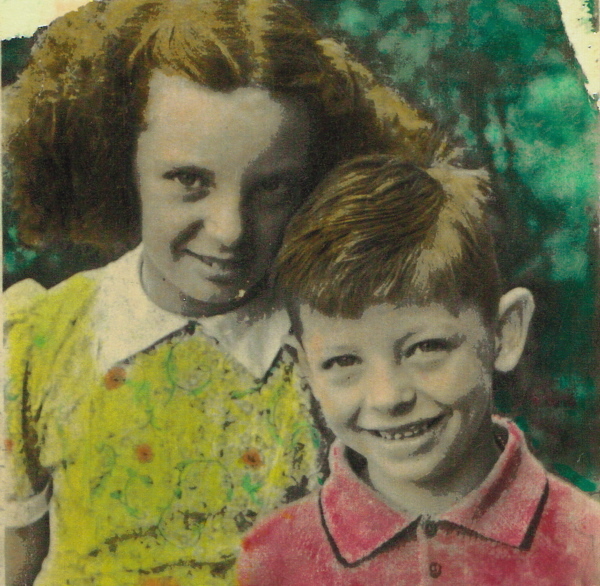 Tony Purser aged seven with his sister. Thank you for another touching post. Still very much enjoying your blog and the fascinating stories you have managed to uncover about Spitalfields life. I love these trips back in time. The stories are captivating and so interesting. Keep it going! What a wonderful face this man has! Such a full spirit and generosity shows in his eyes.